Traditionally, organosilica nanoparticles have been prepared inside micelles with an external silica shell for mechanical support. Here, we compare these hybrid core–shell particles with organosilica particles that are robust enough to be produced both inside micelles and alone in a sol–gel process. These particles form from octadecyltrimethoxy silane as silica source either in microemulsions, resulting in water-dispersible particles with a hydrophobic core, or precipitate from an aqueous mixture to form particles with both hydrophobic core and surface. 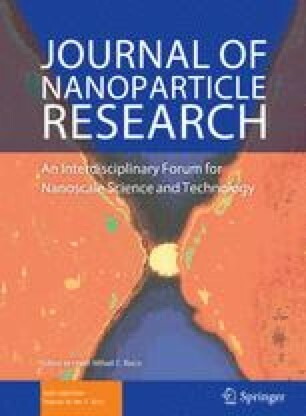 We examine size and morphology of the particles by dynamic light scattering and transmission electron microscopy and show that the particles consist of Si–O–Si networks pervaded by alkyl chains using nuclear magnetic resonance, infrared spectroscopy, and thermogravimetric analysis. The online version of this article (doi: 10.1007/s11051-014-2462-7) contains supplementary material, which is available to authorized users.